K5CM OK Good signal, I did see a pattern in the spectrum that helped my reading this week. K6OQK CA Connie, Tonight your 80-Meter signal took some fades right down into the noise and at times was gone for 3 or 4 seconds. The deep fades added to the unexpected" that makes each FMT something new. Marv's signal was unusually stable this evening. I suppose that's the tradeoff for the differences in distance tonight. Thanks to you and Marv for another great FMT. A very interesting FMT indeed." K6YAZ CA Very weak signals on 80 meters, but was able to get nice 200 Hz tone for SL; 202.54 Hz. Unable to measure individual carriers. W0PHD MN A lot of QRN and WC was weaker than usual; in noise a lot of the time. The frequency and time selection for this time of the year seems to be about right. It is evident that a lot of thought goes into these tests THANKS! W3JW VA Conditions were average to above average with moderate QRN . Doppler effects were moderate but quite noticeable (both on the test signals and WWV). The the two frequency AM mode" waterfall display had as much "doppler spread" as the baseline RF signals had." WA1ABI RI Very difficult condx tonight. QRM on 80; QRN and lots of Doppler on both 80 and 40. 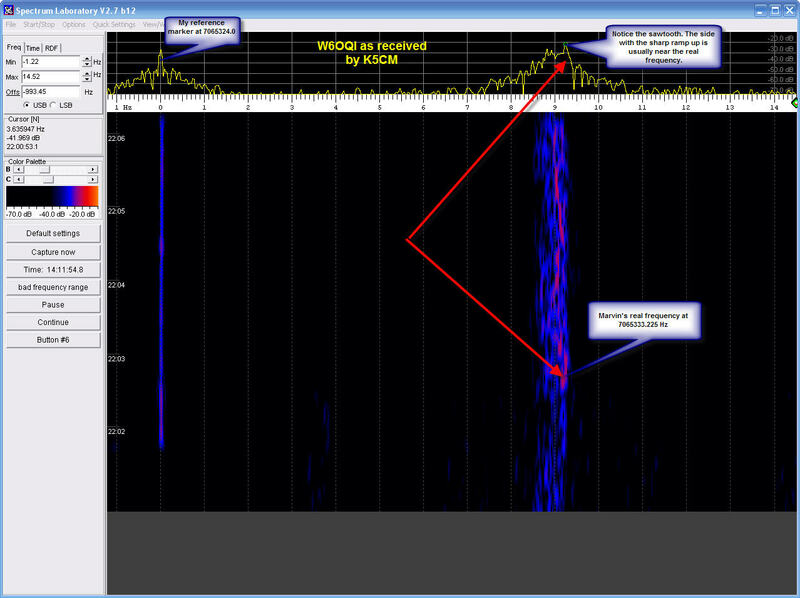 WB9FIP WI Good signals from both Oklahoma and California tonight. Low Doppler on 80 meters, while the Doppler on Marvin's 40 meter signal continues to baffle me. Thanks to Marvin and Connie for the tests. Play the ending sequence of Marvin's 40 meter run. I merged a couple of captures by W3JW, Jeff together. 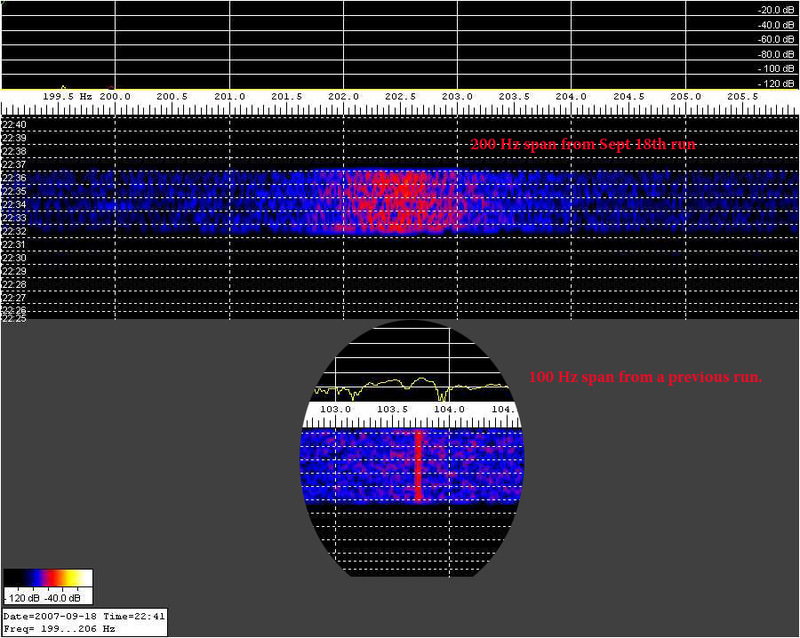 You can easily see the Doppler spreading the 200 Hz run, but the 100 Hz still looks clean. The jury is still out on whether the 200 Hz difference is starting to show signs of Doppler spread. No one hit the FMT "nail on the head" this week, but several were still very close. QRM and QRN may have had some impact on the readings this week (see VE2IQ's comments above and the merged captures above). We will continue the 200 Hz span for at least another run. A HP-Z3801 GPS clocks a HP-3336B and a PTS-250. A small 10 db transistor amp follows and drives a 12BY7 / pair 6146. Then to the final amplifier, a Drake L4B at 300 watts output except on 30 and 17 meters where the power is 75 watts. There are no mixers or any device in the chain of amplifiers that might impact the accuracy of the HP-Z3801. As a reality check, I periodically log the HP-Z3801 against WWVB.